Back in 2008 when we founded Surevine, it seemed natural to us that the collaboration tools we build would enable how we organise ourselves. We set up Surevine to bring the best of what was then emerging in the participative consumer social web (who can remember web2.0?) to the workplace. People were just starting to use the likes of Facebook to organise their social lives, and we placed a bet that what was intuitive and engaging about those technologies could be used to great effect to encourage sharing, collaboration and engagement in the workplace. For most people, that’s a dedicated workspace at home. We give new joiners at Surevine a budget and allow them to make their workspace the most productive they have ever worked in. But we’ve also always had regional Hubs which allows some to have a place that suits them and also provide a location for teams to co-locate as often as makes sense. Our first Hub was the King’s Cross Hub; a coworking space for social enterprises next to the Guardian building, where The Crick has been built and where Google are. This was one of the first spaces of its kind in Europe, at a time when coworking was only really a thing emerging out of Silicon Valley, with wiki pages being used to share information on how to run them. Whilst those provided the perfect kind of place, and the projects of our fellow community members were incredibly inspiring, we didn’t find ourselves surrounded by other technologists. 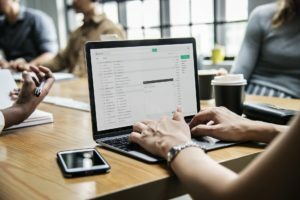 What we did find is that our tools and the understanding we were gaining from helping customers to successfully adopt these tools allowed us to make the most of working in this way. Two things made us start looking beyond TechHub: firstly, the need for more dedicated space for us to get together as teams without disturbing the people around us. I dreamed of a coworking space surrounded by glass where you could see and feel like you were part of a bigger community. Secondly, it happened to be on the wrong side of London for the journey home. So, the news of WeWork coming to Europe and opening its first location on the South Bank in London had us very interested. 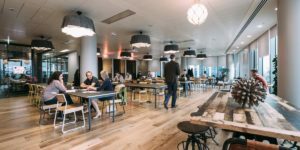 One of WeWork’s founders, Adam Neumann, is said to have been inspired by how Kibbutz operate when deciding how WeWork would run, and it’s clear that Community Management is central to the success of each WeWork location. WeWork has been almost perfect for us: they now have over 30 locations in London making them the largest private landlord in London, so we, as WeWork members, have been able to use their offices in San Francisco, Washington DC, New York, Tel Aviv, Madrid etc. The thing that worked better at TechHub was the coherence between businesses. Our WeWork has a range of businesses but not many Tech startups and even fewer Cyber businesses. That’s one of the reasons we applied for Founding Member status at the new London Cyber Innovation Centre, LORCA (or the London Office for Rapid Cyber Advancement). It’s housed in Plexal at Here East, part of the former Media Village of the London 2012 Olympic Games. We’ve been joined by another high-growth scale-up Cyber business in ZoneFox from Edinburgh, along with some super-exciting emerging businesses fresh out of accelerators like Cylon in London and GCHQ’s accelerator in Cheltenham. There’s no free beer, like there is in WeWork, and the view isn’t as spectacular as the bend in the river I can see when perched at a desk in Surevine’s space on the South Bank. What we do have is an opportunity to be surrounded by perhaps the most exciting innovation taking place in Cyber security in the UK right now. …and it doesn’t get much more hip than Hackney Wick. If you want to schedule a meeting with us at our new office in LORCA, email us at info@surevine.com.